July 2, 2016 will always be a very “Special Day” for the Avery Family. The arrival of “Ozzie” the “Gentle Giant” from Agag with his foster mom (a very special person) was truly a new beginning for all. His name was Oscar but his foster mom called him “Ozzie” and what a perfect name because we all love the movie “Wizard of Oz.” He is gentle, has courage, a big heart and most all loves all who surround him. Favorite times are his everyday walks to the park and being with Jedi, Wrinkles, Bella and Christy and lays beside Olivia his best friend (our granddaughter who was the fist to greet him as he arrived) We love you “Ozzie” and are so grateful to his foster mon and Agag. “There’s no place like home”. As Good as Gold would like to recognize RANGER GOLDEN RETRIEVER FUND for their sponsorship! 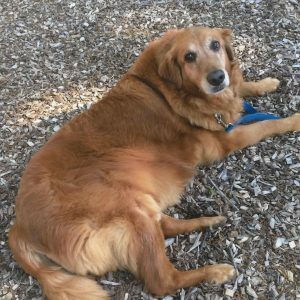 It is fundamental to the continued care of rescued golden retrievers and golden mixes.